What is music? What is art? What is happening in the very moment when the music is created? TAKAGI and musicians who worked with him have pursued these questions earnestly. 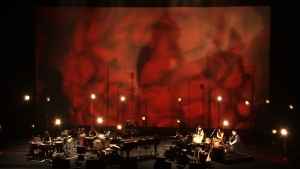 ARUONGAKU is a visually stunning documentary film showing TAKAGI’s projects. Takashi TOMOHISA, born in 1976 in Kobe, studied at Kobe City University. At the Pia film festival he won several awards for his short films SPRING TIME STORY and GOING TO PARADISE AT NIGHT.